Background There are limited data regarding the risk factors and consequences of conversion to endoscopic mucosal resection (rescue EMR) during colorectal endoscopic submucosal dissection (ESD) in Western centers. Methods This was a retrospective analysis of a prospectively collected database, from which 225 consecutive ESDs performed between 2013 and 2017 were selected. Of the included patients, 39 (18.6 %) required rescue EMR. 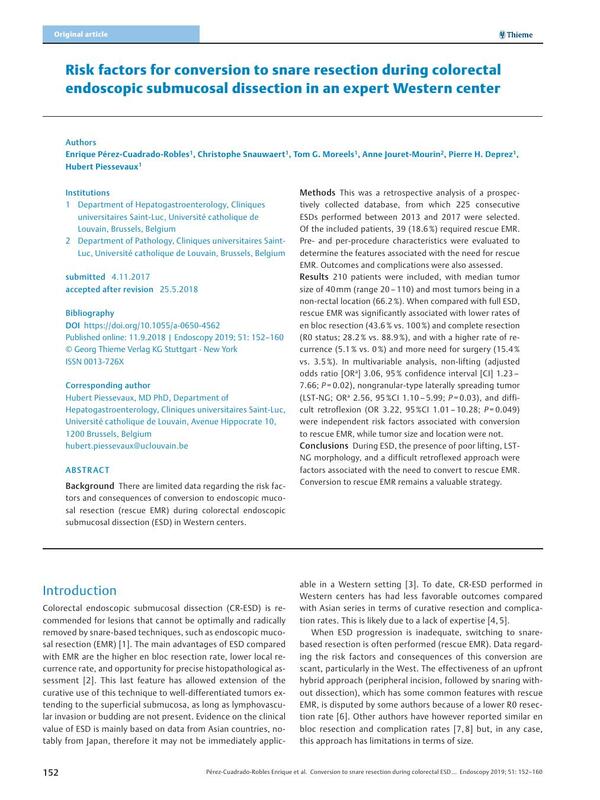 Pre- and per-procedure characteristics were evaluated to determine the features associated with the need for rescue EMR. Outcomes and complications were also assessed. Results 210 patients were included, with median tumor size of 40 mm (range 20 – 110) and most tumors being in a non-rectal location (66.2 %). When compared with full ESD, rescue EMR was significantly associated with lower rates of en bloc resection (43.6 % vs. 100 %) and complete resection (R0 status; 28.2 % vs. 88.9 %), and with a higher rate of recurrence (5.1 % vs. 0 %) and more need for surgery (15.4 % vs. 3.5 %). In multivariable analysis, non-lifting (adjusted odds ratio [ORa] 3.06, 95 % confidence interval [CI] 1.23 – 7.66; P = 0.02), nongranular-type laterally spreading tumor (LST-NG; ORa 2.56, 95 %CI 1.10 – 5.99; P = 0.03), and difficult retroflexion (OR 3.22, 95 %CI 1.01 – 10.28; P = 0.049) were independent risk factors associated with conversion to rescue EMR, while tumor size and location were not. Conclusions During ESD, the presence of poor lifting, LST-NG morphology, and a difficult retroflexed approach were factors associated with the need to convert to rescue EMR. Conversion to rescue EMR remains a valuable strategy. 17 Fuccio L, Repici A, Hassan C. et al. Why attempt en bloc resection of non-pedunculated colorectal adenomas? A systematic review of the prevalence of superficial submucosal invasive cancer after endoscopic submucosal dissection. Gut DOI: 10.1136/gutjnl-2017-315103.